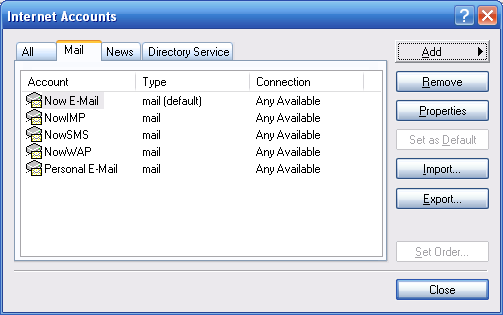 Select Tools/Accounts from the menu bar, and Outlook Express will display the e-mail accounts already defined. 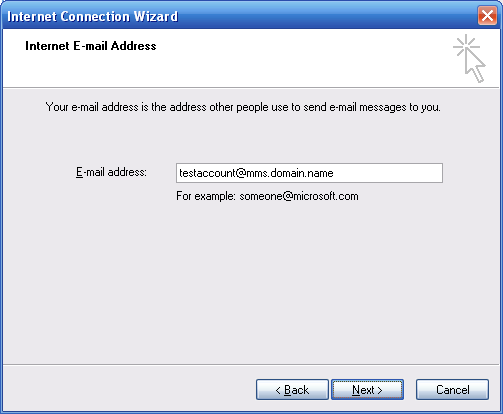 To add a new e-mail account for connecting to an account on the NowSMS server, select “Add” / “Mail”, and Outlook Express will start its “Internet Connection Wizard”. 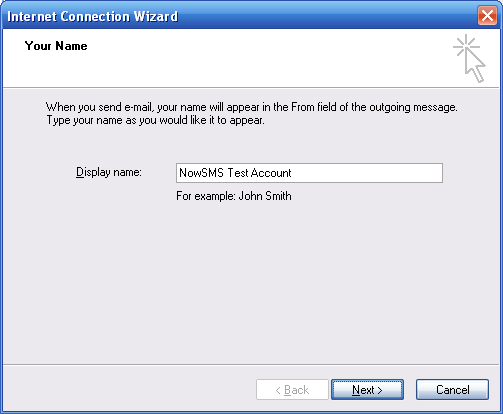 The “Display Name” field is not significant to NowSMS, but will be displayed to identify the account within Outlook Express. 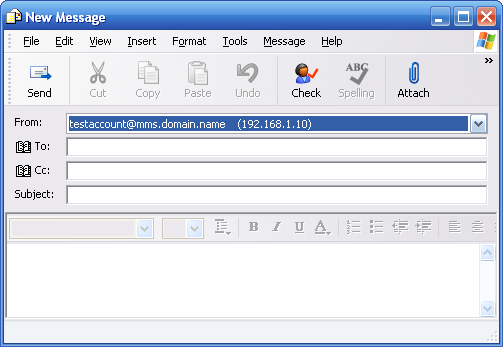 The “E-Mail Address” for the account is the “User Name” defined for the “SMS Users” account @ “Domain Name for MMS E-Mail” as configured on the “MMSC” page of the configuration dialog. 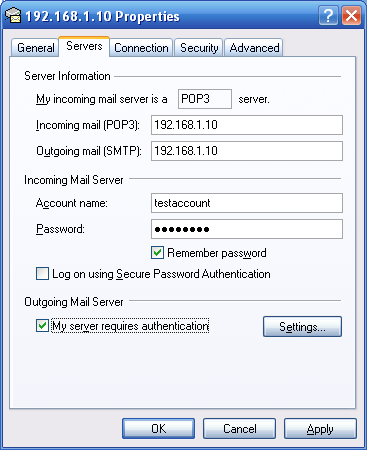 Select “POP3” as the incoming mail server type. 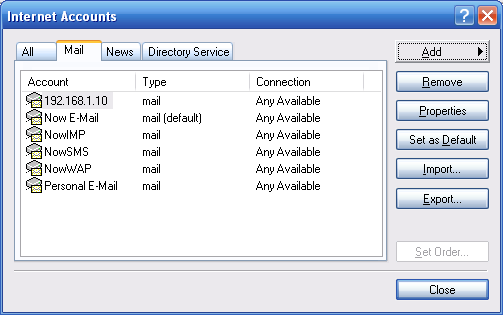 Outlook Express then wants to know the address of the “Incoming” and “Outgoing” mail servers. Input the IP address or DNS host name of the NowSMS server for both the “Incoming” and “Outgoing” mail servers. 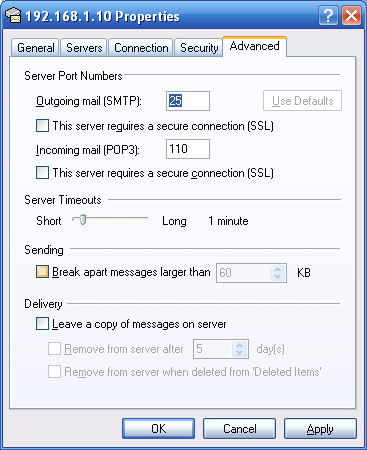 Note that Outlook Express assumes that you are using the standard TCP/IP port numbers for SMTP (25) and POP3 (110). If you are using non-standard port numbers, you will need to perform some advanced configuration steps after completing this wizard. “Account Name” and “Password” should be configured with the “User Name” and “Password” from the account defined in the NowSMS “SMS Users” list. 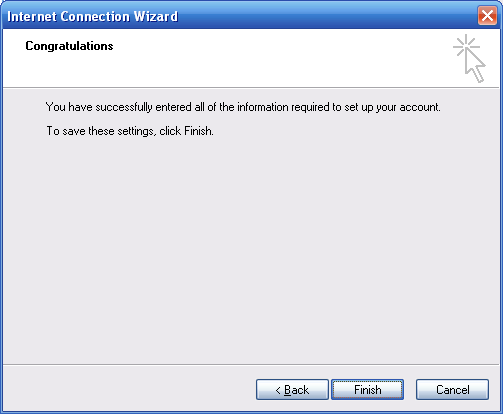 The Internet Connection Wizard indicates that setup is complete after pressing “Finish”, and you are returned to the list of e-mail accounts defined to Outlook Express. The IP address or host name will be displayed as the account description for the account that was just defined. It is now necessary to edit the properties for that account to enable some advanced settings. Highlight the account and press the “Properties” button. Select the “Servers” page in the account properties dialog. Check “My server requires authentication”. This setting tells NowSMS that it must send a user name and password whenever it sends an e-mail message using this account. This is known as “SMTP Authentication”, and this is how NowSMS can identify that the user is allowed to send SMS/MMS messages. 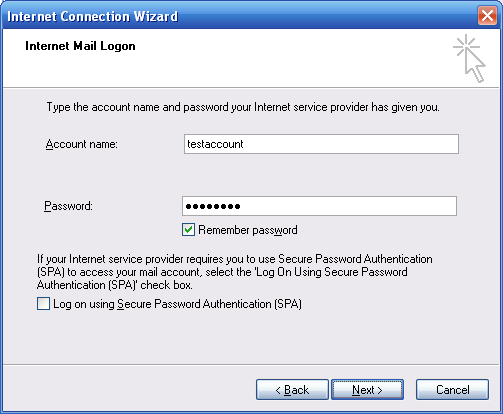 If you are using non-standard TCP/IP ports for the SMTP or POP3 server, it is also necessary to select the “Advanced” account properties dialog. 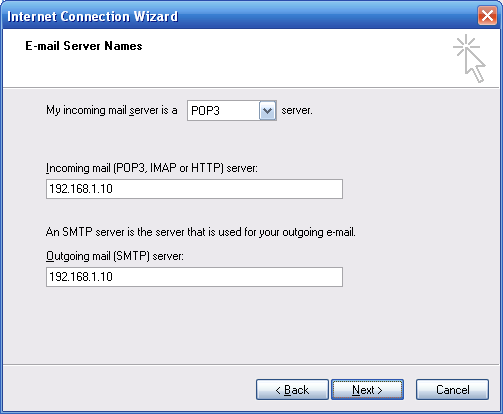 Here you can specify the appropriate ports for the SMTP and POP3 servers.